John McCormack was the chief international artist that came from Ireland’s shores. If there be any feelings which more than others excite the human heart they are the emotions of joy and pride, and by the power of his natural gifts he gave his people immense pleasure and joy, and at the same time, enabled them to be justly proud of their countryman’s fame in the realm of music. My first impression on meeting John was that he seemed to love and imbibe knowledge with a great and vehement love. Music, languages, poetry, paintings, writings – art in its every form – appeared to be part of himself. A deeply religious man, his artistry in song was Godgiven. I always felt while listening to him that he never failed to praise and thank God in his vocal melodies for the great gifts bestowed upon him. In the elusive gift that one calls interpretation he shone supreme. It was not with the lips alone, so to speak, that he sang, but with every vibration of his soul. He sang with spirit and with complete understanding. Those of us who were privileged to hear his rendering of the Panis Angelicus in the Pheonix Park in 1932 – a whole expression of homage and adoration – cannot fail to realise the deep fervour lying underneath all his performances. Many of the world’s best-known musicians have not possessed what may be termed the “all-round” brains of John McCormack; for instance, his unerring skill in programme building. Never, to the best of my recollection, did I hear a suspicion of criticism of the songs chosen by him for his listeners. He was perfection in his choice. On many occasions he actually suggested items to instrumentalists assisting at his recitals, so broad was his knowledge of string music. I know also his great familiarity with the many orchestral symphonies and works – not only did he know them but could rarely be puzzled in the various movements, which he could place immediately on hearing and name their composers and opus numbers. Many conductors envied John his retentiveness on this particular point. I understand he would have chosen – were it possible – to be a great conductor! John McCormack’s contributions to charity have, I fear, never been fully appreciated or realised. How many of us remember his work for our White Cross Fund in 1920? This fund was for the relief of the people of Ireland during the Black and Tan terror. John’s American tour realised £35,000. This sum was acknowledged and published by the White Cross Committee in 1922. Other concerts at the old Theatre Royal resulted in a sum of £1,200 for the Mater Hospital and £1,813 for the St. Vincent de Paul Society. In aid of the poor of Athlone – his native town – he gave a concert by which they benefited to the amount of £1,466. This concert was especially interesting for one reason – it was the only time that a serious rival appeared at one of John’s concerts! On this occasion it was his son, Cyril, then a young boy who, in an Irish costume, canvassed the entire house selling programmes with his father’s autograph, and returned a record sum for his work. 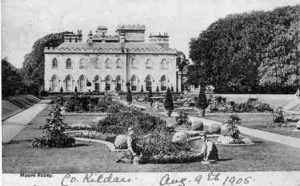 There was also a concert in aid of the Benedictine nuns of the Kylemore Abbey. In addition, his readiness to help various international charities such as the Red Cross Society, French Tubercular Soldiers, etc., kept him with a never-ending list of requests from those in need. He has passed from amongst us a man of splendid character and supreme artistry – one who always gave generous help and encouragement to those about to embark on the difficult road of artistic achievement of which none knew the difficulties and disillusionments better than he. The memory of him shall not depart and his name shall go down from generation to generation as the greatest Irish singer. Many a prayer will be raised here, as elsewhere, for the soul’s happiness of John McCormack.